Our most popular styles use four different frame shapes. 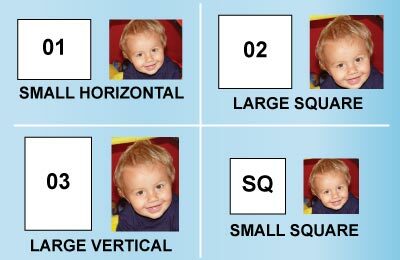 Each photo frame shape (or size) has a code that you will need to know when it’s time to upload and shrink your picture using the EZ Fit photo reduction system. The Memory Maker frame shape codes are 01, 02, 03 or SQ. The code for the frame size can also be found in the description for each product on this website. The measurement of the finished photo size is also listed for your convenience. If your style accommodates more than one picture size, all codes will be listed in the product description. This bracelet holds six photos, the large square. The frame size code is 02. © 2019 EZ Fit Photo. All Rights Reserved.